On 3 October, the critically acclaimed Gair Rhydd celebrated its 45th birthday. Cardiff University’s student newspaper came into being in 1972; nearly half a century on, and with more than 1,000 issues under its belt, it is more widely read than ever. 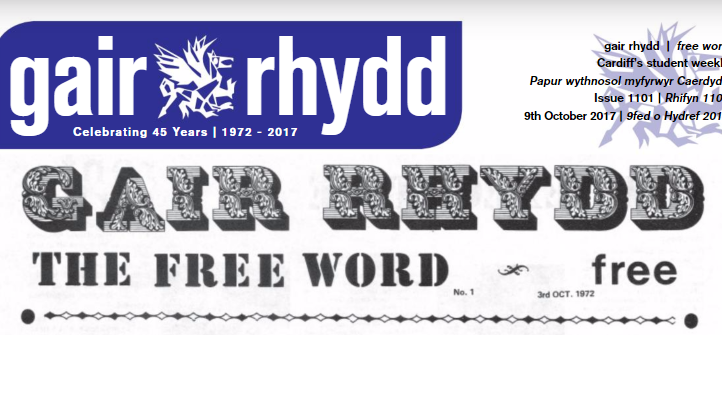 Founded by John Hartley and Dave Aldrige, the very first editorial stated that Gair Rhydd would exist as a “free” paper: “Free because you don’t pay for it, and free because you can say what you want in it”. Gair Rhydd also became the first Cardiff-based newspaper to publish under a Welsh language title – Gair Rhydd translates to English as “free word”. The student weekly has achieved a lot since; and has won numerous high profile awards including ‘best newspaper’ at the Guardian Student Media Awards, and recently received a raft of commendations from the Student Publication Association. Despite the evolution which comes with an ever-changing editorial team, Gair Rhydd has remained steadfast in its adherence to its “free word” moniker. The paper has never been afraid to stand up for students or to represent their perspectives; to this day, it remains staunchly loyal to the interests of its readership across its 8 sub-sections. Despite the emergence of digital publishing, Gair Rhydd can still be found in print across campus. Nor has middle age dampened its innovative look and feel – the Gair Rhydd masthead sits proudly atop a publication that is continually developing in terms of design, content and voice. Countless numbers of Cardiff alumni have contributed to Gair Rhydd’s growth and success; so whether you were an editor, contributor, or simply a reader – tell us your story, and join us in saying: happy birthday Gair Rhydd!